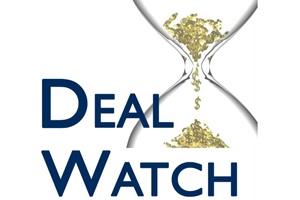 This month's deals continue pharma's ongoing love affair with the oncology sector, with at least eight of the deals reported in our top 20 deals of the month in this field. The prize to the most industrious company this month must go to Celgene as it racked up five deals in the month, with four in just one week! Astra Zeneca (AZ) and Sanofi have also had busy months with three deals apiece; AZ with a focus on looking at combining its lead checkpoint inhibitor with other therapies specifically to target blood cancers. Meanwhile Sanofi is looking to improve its in-house R&D success-rates and reprioritise its portfolio. April has also seen three drug delivery deals in oral, subcutaneous continuous pump and electroporation delivery approaches and three regional deals. Dr Reddy's, Menarini and Cipher Pharmaceuticals have acquired or licensed rights to products in South Asia, Asia Pacific (ex-Japan) and North America and Mexico, respectively. Topping the headlines during April was the bidding war in the ménage-a-trois between Teva, Mylan and Perrigo. In a series of allegedly defensive moves, Mylan has now made three offers for Perrigo Company (the last two binding under Irish takeover rules). The latest offer was made on 29 April of $75 in cash and 2.3 shares for every share of Perrigo, representing at £32.7bn (the previous one was $60 cash plus 2.2 shares for each Perrigo share ($222.12) with a total value of $31.2bn). The initial non-binding proposal of $205 per share, approx. $28.9bn was rejected by Perrigo as a serious undervaluation. Perrigo have continued to reject these later offers as the cash-and-stock bids rely on shares inflated by separate takeover interest in Mylan from Teva and are therefore still below Mylan's original proposal of $205 per share. Perrigo refer to Mylan's unaffected price of $55.31per share on March 10, the last day of trading prior to widespread public speculation that Teva was considering an offer for Mylan. Using this share price the value of the revised third offer is $202.20 per Perrigo share. Teva didn't disappoint and has entered the fray with a hostile counter offer of $40.1bn for Mylan, conditional on no transactions going through. Teva forecast £30bn in annual revenues and up to $2bn in cost savings. The bid for Mylan represents $82 per share (split 50:50 between shares and cash) and was unanimously rejected with anti-trust issues and lack of cultural fit cited by Mylan. Clearly this love triangle still has a way to go and we will watch with interest as it evolves in the following months as the generics/OTC markets continue to consolidate. Mylan is keen to quickly cement a deal with Perrigo to thwart Teva and to prevent other would-be suitors for Perrigo to emerge from the wings. Teva is keen to acquire Mylan to consolidate its position in an ever competitive generics market and reverse the loss of market share, for example to India's Sun Pharmaceuticals. In addition, Teva also faces the threat of competition to its blockbuster multiple sclerosis Copaxone from rivals offering cheaper drugs, including one in development from Mylan. Should Teva win the day, there will undoubtedly be need for some divestments to satisfy the competition authorities. Watch this space! After years of promise and failing to deliver, gene therapy companies are back in favour. Following Glybera's approval in Europe for lipoprotein lipase deficiency (LPLD), uniQure, the gene therapy pioneer has announced an exclusive strategic collaboration with Bristol Myers Squibb (BMS) for its lead candidate for heart failure with a headline value which could exceed $2bn. uniQure has licensed its proprietary gene therapy programme for congestive heart failure, that is hoped will restore the heart's ability to synthesise S100A1, a calcium sensor and master regulator of heart function. In return it will receive $50m upfront for rights to S100A1 and another $15m within three months for three other cardiovascular candidates. BMS will also take a 4.9% equity stake in uniQure which will cost around $32m, with another 5% ownership scheduled before the end of the year (at 10% premium). UniQure also stands to receive research, development and regulatory milestones, including up to $254m for the lead project and up to $217m for each subsequent product. In total, the companies may collaborate on 10 targets. UniQure will head the discovery effort, with responsibility for manufacturing clinical and commercial supplies using its vector technologies and insect cell-based manufacturing platform, while BMS will handle and fund development and regulatory activities for all programmes, with sole responsibility for the sale of products arising from the alliance. While the concept of gene therapy presents a transformational change in the treatment paradigm, there continue to be concerns about their likely exorbitant pricing. Glybera's $1m cost per one-off treatment has raised questions about how healthcare systems will be able to afford this new, highly-targeted form of therapy, particularly when it start to become available for common diseases such as heart failure and cancer. In a way of mitigating these concerns it has been suggested that these treatments would likely be priced on an amortised basis, including adjustments for the success or failure of the therapy. With so much continued hype around oncology especially with some of the promising new technologies CAR-T cells and immune checkpoint inhibitors, we are also starting to see companies looking to collaborate across technologies to find multiple routes of targeting and eradicate tumours. As mentioned above, Celgene had an exceptionally busy month announcing deals with Quanticel Pharmaceuticals, AZ, Agios Pharmaceuticals, Mesoblast and Northern Biologics. Both Quanticel and Northern Biologics are graduates/alumni of the Versant Ventures stable. Versant Ventures follows the 'build-to-buy' model of partnering with large drug companies to seed a start-up with a view to the drug company acquiring the investee down the line. After originally investing $45m in Quanticel, back in 2011 (when it was spun out from Stanford), Celgene is spending $100m upfront (with a further $385 to come in milestones) to secure the company's discovery platform. Celgene has also made a $30m upfront payment to Northern Biologics, which was spun out from the Canadian incubator, Blueline Bioscience with $10m series A funding last year. Celgene's payment is for an option to further in licence or acquire the company. Celgene's other deals are with Agios Pharmaceuticals, Mesoblast and AZ. With Agios one of its existing partners, they have struck an $80m option deal with $10m upfront and $70m to come in milestones for access to AG-881, an IDH (isocitrate dehydrogenase) mutant inhibitor which targets cancer metabolism in haematologic and hematologic and solid tumour malignancies, including acute myelogenous leukaemia (AML) and glioma. This is the third deal between the companies. Australian Mesoblast the developer of stem-cell therapies has agreed to sell a minority stake (~4.5%) in the company to Celgene for $45m (A$58.5m). Celgene, will gain six months right of first refusal on Mesoblast's stem-cell product candidates for conditions including inflammatory bowel disease and certain oncological indications, for global rights (excluding Japan), where Mesoblast already partners with JCR Pharmaceuticals. Completing the deal haul is the exclusive collaboration around AZ's MEDI4736 for an upfront payment of $450m plus royalties. MEDI4736 is an immune checkpoint inhibitor which is targeted against programmed cell death (PD-L1). Under the terms of the deal, Celgene has the rights to develop the product for non-Hodgkin lymphoma (NHL), myelodysplastic syndromes and multiple myeloma. Celgene will undertake the clinical development through to the end of 2016 (picking up 100% of the costs) at which point the contribution drops to 75%. AZ retain manufacturing rights with Celgene responsible for commercialisation but AZ will book the sales and pay a royalty. This royalty starts at 70% reducing to 50% over four years. Striking a deal with Juno, AZ is following the industry's obsession into CAR-T technology, but is the first to announce the plan to combine with a PD-1 or a PD-L1. The collaboration brings together AZ's MEDI4736 with one of Juno's CD-19 CAR-T cell candidates to a jointly funded phase 1b study, scheduled to start later this year. There is also the potential to add another new CAR-T cell candidate in the future. No deal terms were disclosed. The initial development plan will look at the combination therapy as a potential treatment for NHL. Continuing to build the oncology portfolio and looking to score a win with a combination therapy, AZ in-licensed Innate Pharma's IPH2201 for both monotherapy and also in combination with MEDI4736 paying $250m upfront. A further $100m is due as a milestone pre-phase III with an additional $925m bringing the headline value to $1.28bn. The agreement also includes payment of double digit royalties. Innate also put in place a collaboration with Sanofi for next generation antibody-drug conjugates (ADCs) using Innate's site specific conjugation technology; financial terms were not disclosed. Roche has also been forging an immunotherapy alliance this month, this time with India's Curadev Pharma for a headline of $555m to develop and commercialise IDO1 and TDO inhibitors. IDO1 (indoleamine-2, 3-dioxygenase-1) and TDO (tryptophan-2, 3-dioxygenase) are enzymes that mediate cancer-induced immune suppression. Dual inhibition of these pathways has shown promise in maintaining the immune response and preventing local tumours from immune escape, and it is thought they could also help avoid resistance to other immunotherapies when used in combination with other drugs. Under the deal, Roche is paying $25m upfront and $530m in milestones for access to Curadev's lead candidate, which could work as a monotherapy as well as in combination with Roche's cancer drugs. As part of its ongoing re-prioritisation and trimming of its oncology pipeline and correspondingly downsizing and reorganising the R&D teams, Sanofi is terminating its agreement with ImmunoGen and its SAR3419, an antibody-drug conjugate designed to treat diffuse large B-cell lymphoma (DLBCL) and other blood cancers. The treatment combines an antibody engineered to target CD19 with the cancer-killing agent maytansinoid. In a phase II study on DLBC SAR3419 achieved a 43.9% objective response rate, to which investigators heralded its potential as a second-line therapy. But not significant enough for Sanofi maintain its commitment to the programme. Under the leadership of new CEO Olivier Brandicourt, there's a move to improve productivity in its reorganised R&D division to ensure it can deliver the targeted 18 new drug approvals over the next five years (including up to six this year and about one every six months from then on). To help achieve this goal, Sanofi have struck a deal with Schrödinger to use computational design technology to help to assist on target analysis and validation to lead identification and lead optimisation for10 drug discovery programs. The regional deals continue as companies look to gain or consolidate footprints in local or regional markets and others correspondingly look to look to slim down operations in far flung locations. Previously rumoured, Dr Reddy's acquires rights to dermatology, respiratory and paediatric products from UCB in South Asia for $128m (INR800 Crores), together with 350 staff. The acquisition of this portfolio with sales of INR 150 Crores, will help Dr Reddy's maintain a competitive edge with fellow Indian rival Sun Pharmaceuticals, following its acquisition of Ranbaxy earlier this year. In the same part of the world, Menarini Asia Pacific Holdings (part of the Menarini group) have announced a licensing and development agreement for 4SC AG'S resminostat an oral histone-deacetylase (HDAC) inhibitor in all oncological indications, in particular hepatocellular carcinoma in Asia Pacific (excluding Japan). Resminostat has an innovative epigenetic mechanism of action that potentially enables the compound to be deployed as a novel, targeted tumour therapy Menarini is paying $102m (€95m) in upfront fees and milestones and 4SC will be entitled to double-digit royalties on products sales on resminostat. Menarini AP will be responsible for the clinical development, regulatory approval and commercialisation of resminostat in all oncological indications, and in particular liver cancer (HCC). These are key markets for this product as more than 75% of all HCC cases occur in the APAC region, largely in association with chronic hepatitis B virus (HBV) infection. Approximately 50% of HCC cases globally occur in China alone. Finally for this month, US based Cipher Pharmaceuticals has announced the acquisition of Innocutis Holdings and with it gained rights to US, Canada and Mexico for Sitavig. In March 2014, French company Onxeo entered into a license agreement with INNOCUTIS regarding Sitavig (acyclovir mucoadhesive tablet for cold sores) for commercialisation in the USA, Canada, and Mexico. Under this agreement, Onxeo is eligible to receive a total of $5m in upfront and milestones payments ($2m received in 2014). is a principal at Medius Associates and has over 18 years of corporate finance and business development experience within the healthcare industry.